THE HAVANA SPECIAL EXPRESS crossing the two-and-a-half miles stretch of Long Key Viaduct on the way to Key West. A CYNIC once said of Christopher Columbus’s discovery of America: “He did not know where he was going when he left; when he arrived he did not know where he was; and when he came back he did not know where he had been”. This observation might almost be applied to the American oil king, Henry Flagler, an associate of Rockefeller, who was directly responsible for the development of America’s Riviera, Palm Beach, and the construction of an unique railway over the waters of the Mexican Gulf to the island of Key West. When Flagler came one winter to a sleepy little town in Florida, St. Augustine, he had no conception of the vast enterprises he was shortly to sponsor. After a brief stay, however, the financier began to realize the possibilities of turning St. Augustine, with its pleasant climate akin to that of southern Europe, into a holiday resort for the American citizen. His first step was to build there a large and luxurious hotel, calling it “Ponce de Leon”, after the man who discovered Florida in 1513. De Leon named the country Florida - full of flowers - because of the profusion of blossoms there. Flagler next ensured St. Augustine’s communication with the outside world by acquiring and widening the old narrow-gauge line to Jacksonville, a town 36 miles to the north. In a short time St. Augustine became the ultra-fashionable resort of the South, to which the wealthy journeyed in search of winter sunshine. Encouraged by his success at converting a dilapidated row of huts into a smart resort, Flagler looked farther south for other opportunities. He bought up more railway tracks, relaying, widening and improving them. By April, 1894, the railway had been completed to the village of West Palm Beach. The new town was developed on expensive and exclusive lines and proved a great attraction. This success promoted the forming of the Florida East Coast Railway Company to deal adequately with the tourist traffic. In the winter of 1895 a great frost wrought havoc in the orange groves near Palm Beach, and families dependent upon the orange industry were faced with ruin. Flagler himself learned, however, that only 65 miles farther south, at Miami, the effects of the frost had not been felt in any way. Accordingly it was decided that Miami would in future be the home of orange growing. The railway was once more extended, and new gardens, homes and orchards sprang up along the route. The railway company was now materially assisting and encouraging not only tourists but also orange farmers. As Flagler carried his railway farther and farther south he saw the importance of having some southern outlet or port with the idea of developing a channel of commerce and travel from the United States to Cuba, Central America and the Panama Canal. (The construction of the Panama Canal had already begun, and doubtless this influenced the financier’s ultimate decision.) Late in 1904 orders were given to make surveys to Key West in the Gulf of Mexico, and during that same year the railway reached Homestead, a town 28 miles south of Miami. Key West itself is situated upon a small coral island, connected to the mainland by only a series of other tiny islands and coral reefs. It is called America’s Gibraltar, being to-day of vital importance as a naval and military base, as well as having a large trade in cigars, sponges, fish, turtles and fruit. SEVEN MILES LONG. This great bridge, built of steel and concrete, spans the sea between Knight’s Key and Pigeon Key in the Gulf of Mexico. The bridge is known as Little Duck Viaduct and is the longest in the over-sea extension of the Florida East Coast Railway. Immense difficulties opposed the construction of a railway across the isolated chain of small islands or “keys”. Flagler’s fellow financiers declared the project unthinkable and railway engineers deemed it impracticable. For one thing there were no materials immediately at hand. Drinking water, food supplies, rock for filling and building embankments, cement, timber for the piles, steel and machinery - everything had to be collected and brought from several distant sources. Surveyors, nevertheless, set out to plot a possible route. Beyond Homestead they encountered the low-lying strip of territory known as the “Everglades”, a maze of pools, lagoons and half - submerged islands that once covered 8,000 square miles. The vast basin occupied by the glades is rimmed by limestone and full of dense vegetation in which lurk panthers, alligators and crocodiles. Through this dreary region went one party of surveyors, while another investigated the keys, taking note of the depth of channels, the tides, wind pressure, current variation and the storms which frequently sweep across this chain of little islands. The reports were eventually completed; and no definite estimate of cost was available, owing to the hazardous nature of the scheme, but the expenses would inevitably be gigantic. Flagler, several times a millionaire, did not consider this. Once convinced that the line to Key West could be built, he ordered operations to begin forthwith. A Mr. Meredith, who had proved his ability in the construction of large docks at Tampico, across the Gulf of Mexico, undertook the command as engineer-in-chief. The railway to Key West had to cover 128 miles. For 91 miles the railway was built on the tip of the mainland and across the various keys comprising those portions of the coral reef which emerge from the Mexican Gulf. For the remaining 37 miles the railway was constructed over the sea - 17 miles by bridges and 20 miles on embankments. In April, 1905, the track was begun through the “Everglades” section. Owing to the ground being densely enmeshed with the tenacious roots of swamp vegetation, the usual methods of building an embankment were useless. Huge dredgers had to be employed to cut a path through the lagoons. The great scoops dug up undergrowth and spoil, heaping it into a long ridge extending from Homestead to Jewfish Creek, at which point the rails leave the land for the sea. Building across the water tried the engineers’ ingenuity and skill to the utmost, although the distances between the islets were not always great. The water between some of the keys was shallow enough to allow the construction of embank-ments. In other places, trestling, viaducts and steel bridges had to be built, the foundations of which rested on the hard coral rock. Ships plied continuously between the keys, and navigation rights had to be observed by the introduction of moving bridges. HOUSE BOAT. 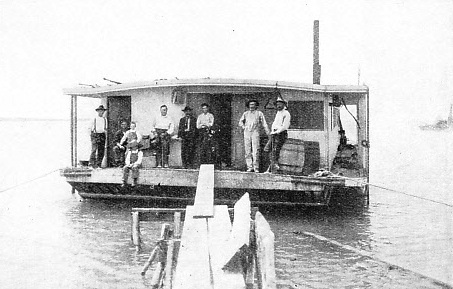 It was impossible to find quarters on land for the workmen building the line to Key West, and so large barges or scows were converted for use as floating camps. The men were conveyed to and from their work in the boats shown. One of the most acute difficulties which confronted the engineers was the housing and feeding of the thousands of workers employed on the construction. As the men could not be housed on land, they had to be accommodated on the sea. For this purpose many barge-like vessels were built, on which were erected timber huts. The barges were moored near the workings and small boats carried the men backwards and forwards. The supplying of these vessels was undertaken by steamers, which also moved them from place to place and brought up the water-tanks, fresh water having to be transported from the mainland. For bad accidents, and cases of disease, a hospital was opened at Miami; less serious ailments were treated at a field dressing station. During the seven years of construction there were comparatively few fatalities, partly due no doubt to the excellent climate of Florida. If the army of builders was a queer miscellany of colour and race, the types of boats that assisted in the enterprise also did not lack variety. Among the odd collection of craft were dredgers, schooners, floating derricks, pile drivers, concrete-mixers and stern-wheel steamers, carrying equipment and supplies. The construction of steelwork and the mixing of concrete for viaducts and piers was carried out in navigable “yards”, similar to floating docks, moored in convenient positions. Overseers, messengers and engineers used a small fleet of motor launches to tour the construction. The bridging section of the Key West Extension included six structures of steel, four drawbridges and twenty-nine separate concrete viaducts. The depth of water at the bridge sites changed from a few feet up to some thirty. When Long Key was reached, the builders encountered the first big stretch of water. 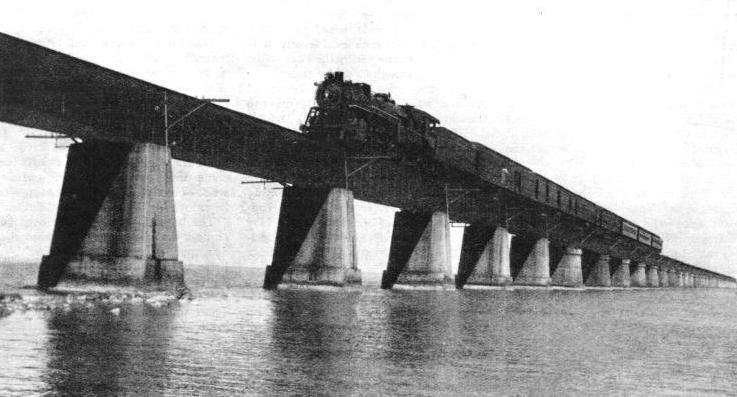 This section was overcome by the Long Key Viaduct, two and three-quarter miles in length, consisting of 180 semicircular arches of 50 ft span, with the rails laid 30 ft above high tide. This viaduct was one of the first of its kind in America. The prevalence of devastating hurricanes and heavy seas made it imperative that the structure should be unusually strong. First, the positions of the piers were charted, then dredgers scooped the sand from the sea’s bed, exposing the coral rock necessary for foundations. Next, tugs towed up coffer-dams, huge steel cylinders, which were lowered over the dredged positions. Floating pile-drivers then drove steel-pointed piles into the coral rock until they were securely fixed. Through this method of working there was less risk of the piles slipping owing to shifting of rock, for the constructors were able to determine if the rock was solid or unstable and crumbling. After the sinking of the piles, concrete was dumped upon the sea bed to a depth of 5 ft, forming the real basis for the piers. Moulds were used for the shaping of the reinforced concrete arches and great precautions taken to obviate cracks set up by expansion. The rubble for the concrete was blasted out of the coral, and lifted on to floating platforms, where it was flung into large mechanical mixers. When the track passed over shallow water travelling excavators were utilized to form a solid embankment of debris. Pipe-lines were laid down in some places along the centre of the permanent way, and the ballast pumped through these conduits was deposited where required, the water draining off. The drying and draining of these embankments took a long while owing to the saturated state of the soil. It was found that the destructive force of the waves lay not in their impact against the bank, but in their retreat or under-tow, which dragged away and undermined it. Experiment proved that a smooth surface, over which the heavy seas might glide and in their retreat find no hold, offered the best solution to the problem. Material for such a coating was discovered in the marine marl deposits along the line. This form of clay spread over the surface of the embankments, hardened on exposure to the air, and was capable of withstanding the heaviest seas. Meredith, the chief engineer, died at his post when the rails had almost reached the Knight’s Key section. At Miami, close by the railway, a granite monolith stands to-day to the memory of this clever and courageous railway builder. William Krome, who had been Meredith’s chief adviser and assistant, took over the command. NORTHWARD BOUND. An express at Miami, with passengers who have completed the adventurous journey across the waters of the Gulf of Mexico from Key West. The railhead approached Knight’s Key itself in February, 1908. Operations then ceased temporarily while the constructors considered how the seven miles of sea, varying from 18 to 22 ft deep, should be overcome. Owing to the impossibility of dumping for an embank-ment, it was decided to build a viaduct. This Knight’s Key Bridge is the longest single structure in the whole Key West Extension, stretching seven miles across open sea. From one end of it the distant shore is barely visible. Due to the depth of the water, huge steel girders mounted on concrete piers were used. The bridge comprises 316 80-ft spans, 19 60-ft spans and 210 53-ft concrete arches at the southern end where shallower water was found. The track itself lies 30 ft above the low tide water mark. At the point where the lines run across Moser Channel a swing bridge, approx-imately 250 ft in length, was introduced to allow the passage of shipping. At Bahia Honda (Spanish for “deep bay”) came another strip of open sea, where depths of 30 ft were encount-ered, and this presented an even greater obstacle than the Knight’s Key section. Bahia Honda has a total length of just over a mile. Here another bridge had to be constructed, having 13 spans, each 128 ft long, 13 spans of 186 ft, and one more of 247 ft. In addition there are nine arches of 80-foot span. When the work on bridges began beyond Knight’s Key the setting of the steel was given to various contractors. As this method proved unsuccessful, the operations were put exclusively in the hands of the engineer’s own men. The deck girder spans were brought to the piers on barges, and were then lifted and set in place by floating derricks. The railway gangers completed their tasks in less than half the time taken by the contractors. On one occasion six spans were placed in position within four hours, while on another the labourers erected a span in twenty minutes. The Bahia Honda bridge was built by means of temporary timber framework and an overhead travelling crane. The precautions taken to ensure the workers’ safety were such that not a life was lost during the erection of the 32,900 ft of steel that went to the building of Knight’s Key and Bahia Honda bridges. But even these two great bridges did not suffice. Before the island of Key West could be reached by the railway yet another 2,500 odd feet had to be traversed, and the authorities decided that a viaduct would be best for this remaining part of the route. The engineers had yet another problem in the adequate protection of the vast quantities of steelwork in the bridges from the effects of oxidization caused by exposure to salt water. The excessively moist air of Florida also rusts metal within a short space of time. Experiments to discover the most suitable rust-proof paint had been numerous, based, for the most part, on the anti-fouling compositions of red-lead similar to that used on ships’ keels. The rails are also exposed to the rapid corrosion set up by the saturated air and are treated with a special protective covering. Despite the tropical storms and hurricanes which abound in this part of the world, the extension has successfully withstood the most violent attacks which the ruthless fury of nature can unloose. One of the worst hurricanes experienced beat down upon the works in 1906. The engineer, who had been carefully observing atmospheric conditions, noted an approaching disturbance, and the governmental observatory also gave him due warning. The builders, however, had received a false alarm in 1905 and did not take sufficient heed. The storm swept mercilessly upon the workings. The gangers scurried to the frail shelter of their floating quarters on the barges. The houseboats were torn loose from their moorings; some were driven out into the fury of the raging sea, while others were flung and shattered against the keys and reefs. Passing steamers rescued many survivors after days of exposure, but more than seventy men were lost. In 1909 another hurricane reached a velocity of 125 miles an hour. This time, warning instructions were observed and the barges towed into safety beforehand. Although miles of embankment were washed away no real damage was done to the concrete work. Five girders on Knight’s Key Bridge were blown from their piers due to the failure of the contractors to put in the necessary number of anchor bolts. A study of the destructive force of these storms was responsible for many radical changes in construction plans, and as a result the present work is practically stormproof. ACROSS THE OPEN SEA. The express crossing the water on the famous Knight’s Key Bridge presents an impressive spectacle. Necessarily high above the waves, the train is exposed to the full force of the gales prevalent in these semi-tropical regions. Despite the original character of the railway, it was completed with amazing rapidity. January, 1912 - one year ahead of schedule - saw it finished and ready for traffic. The first express which ran to Key West carried with it the man so largely responsible for the work - Henry Flagler. Through connexion to Key West from New York can be made by the crack express of the Pennsylvania and Atlantic Coast lines - the “Havana Special” - linking up with the Florida East Coast line at Jacksonville. On the long viaducts and bridges the speed of the trains is strictly limited. 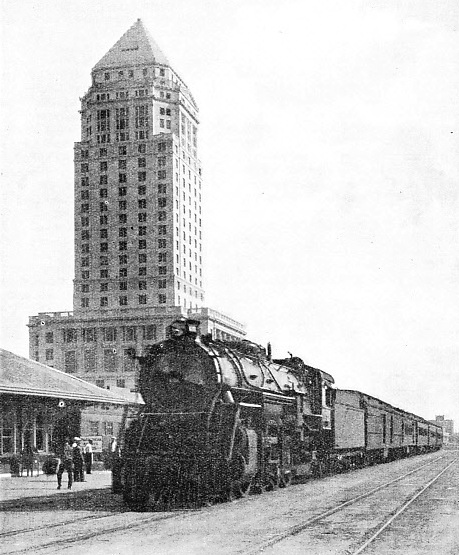 The “Havana Special” leaves the Pennsylvania Station at New York at 10.05 pm, and arrives at Jacksonville 22¾ hours later. Through “sleepers” to Miami and Key West reach their destinations the following morning, the overall journey to Key West taking 37¾ hours. Included in the equipment of this palatial express is a swimming pool. At Key West extensive terminals were created. These facilities cover an area of some 140 acres, of which the larger part has been reclaimed from the ocean by filling up the shallow reaches. A spacious station has been built in conjunction with a concrete pier, nearly 2,000 ft in length, and wide slips, excavated out of the solid rock enable any fair-sized vessel coming into the port to be berthed. Through this port connexions can be made with Havana, the capital of Cuba, which lies only ninety miles to the south of Key West. Huge car ferries, each capable of transporting twenty-six vehicles, operate regularly between Key West and Havana and also convey loaded freight vans from the Florida East Coast Railway to Cuba. Passenger trains make convenient ship-side connexion at Key West with the Peninsular and Occidental Steamships plying to and from the Cuban capital. Some remarkable figures give an excellent idea of the vast amount of work involved in the construction of the Key West extension. The project from beginning to end meant the assembling of 38,000 tons of structural steel, 461,000 cubic yards of concrete; the transport and distribution of 800,000 barrels of cement, 96,000 tons of rock, 78,000 tons of gravel, and 300,000 cubic yards of corraline rock. In addition to this the constructors had to shift some 2,000 tons of reinforced steel, 70,000 pine piles, and approximately 100,000 tons of spoil for filling in shallows and making up embankments. When it is realized that most of the material had often to be conveyed some hundreds of miles, the full extent of the labour and organization required for building a railway out to sea will be appreciated. The railway has awakened the formerly desolate untenanted keys. All along the islets fashionable resorts have come into existence where excellent sport - chiefly fishing and boating - can be enjoyed in Florida’s warm climate. The building of Key West over land and sea under a torrid sun, across channels and surging waters, across bleak little islands, swept by fierce tropical storms, ranks as one of the greatest achievements in railway engineering. There were no precedents to follow, for nothing like it had ever been attempted before - or has been since. The methods of constructors had to be developed to meet untried conditions, and those methods proved successful; the Key West extension still withstands the imponderable forces of nature - wind, sea and tide. JOURNEY’S END for this train is Key West, where an important connexion for Havana, the capital of Cuba, is provided by steamer. 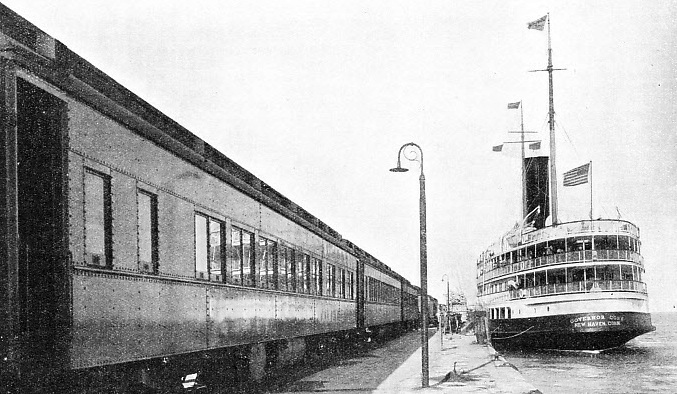 This picture shows the S.S. “Governor Cobb” alongside a stationary train bringing passengers from Miami. You can read more on “Brighton’s Electric Railway”, “A Railway Which Goes to Sea” and “Railway Curiosities” on this website.